Start the path to your renovation success today! Join The DIY Renovation Academy. The DIY Renovation Academy steps you through EVERYTHING you need to know for your DIY renovation, to create that 'WOW' factor without blowing your budget! Style your property like a professional. Get that luxe look for less! A one-on-one consultation call with The Renovate Avenue founder and expert renovator, Claudia Brdar to review your DIY renovation plan. All of this for unbeatable value at $497! View the full Student Agreement here. Material given to You in the course of your work with TRA is proprietary and copyrighted. You agree the material is solely for your own personal use. Any disclosure to a third party is strictly prohibited. You are granted as a single-user license. 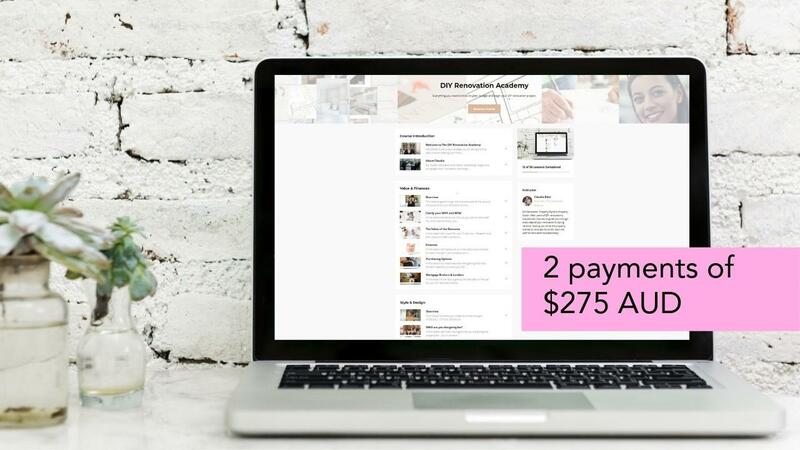 By purchasing The DIY Renovation Academy you will create an account to access any eBooks, Online Courses (free or paid) or other products purchased from The Renovate Avenue, and you consent to subscribe to The Renovate Avenue newsletter. You can unsubscribe at any time by clicking on the link in the newsletter or by logging into your account and changing your subscribe settings. If you unsubscribe, you will not receive ANY emails including transaction emails for future product purchases.